Saturday afternoons in Preston; what more could you want? There’s something about local footy. It’s the bright Saturday morning, hopping into the car with a footy in hand. It’s the bubbly chatter, flying through familiar suburbs discussing interesting information and local news. It’s the arrival, sitting and watching the reserves while the crowd packs in for the seniors match. It’s the kick on the ground, the intimate back-slaps to triumphant players and the heavy amount of familiar faces that you run into. 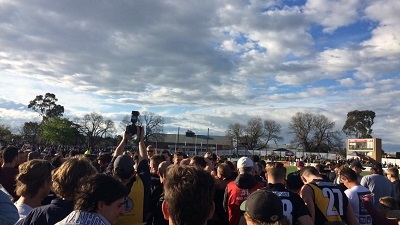 Preston City Oval was alight with this on Saturday, as the kindred feeling shared by the footy-loving community culminated into a unified roar when the final siren rang on the Northern Football League’s Senior Division 1 Grand Final. It signified the end of a terrific day. 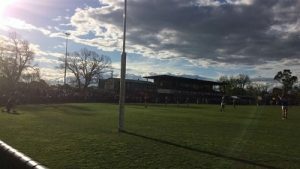 Local footy once more was supreme in the northern suburbs of Melbourne. My involvement with the NFL’s day of days began at 11, when I piled into the car and picked up a friend en route to Preston City Oval. Struggling for a car park in the beautiful sunshine, the light walk allowed the bubble of the crowd to slowly build up until we were past the gates and into the ground. 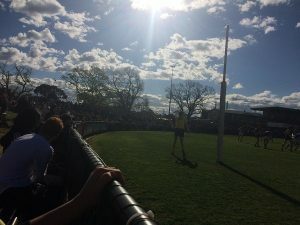 Up into the grandstand we went, as Heidelberg coolly slotted the first goal of the reserves Grand Final. 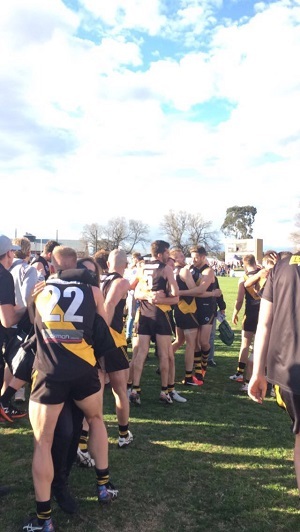 It was to be the first of a do-or-die day for Heidelberg Football Club. 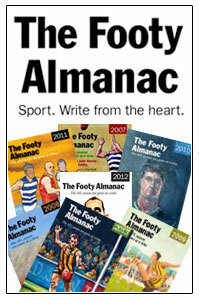 They went into both the reserves and seniors Grand Final’s as underdogs. These are the days that local footy clubs are built upon. The reserves match was a tough affair, with perennial enemies Greensborough and Heidelberg cracking in hard. Greensborough were fresh off winning their third Under-19’s Premiership in a row, and were looking to go back to back in the reserves stakes. The faithful of the ‘slime’ (due to their emerald green jumpers) congregated onto the main hill, erecting banners and signs that stirred the tension between the two clubs. One could sense the resentment held by the supporters; they had been robbed of the trifecta (Undr-19’s, Reserves and Seniors Premierships) in 2015 by an upset Macleod victory in the seniors. By the looks of things, they held a bitter hatred against any club in the competition, as they were desperate to win as many flags as possible. By the time the last quarter came around, Heidelberg held a fragile 11 point lead. Against the odds, but with the strong wind, the Tigers came roaring home. The wind blew apart Greensborough’s precision like kicking, allowing the tough nuts of Heidelberg to pounce. The inaccurate kicking by the ‘slime’ costed them, as a best on ground performance by pocket rocket Daniel Cookson and a blasting third quarter from veteran Mark Favrin (who finished with 4 goals for the day) allowed the ‘Berg to romp to a 43 point victory. The presentation kicked off while the crowd arrived in tsunami-like waves. By the time I had ventured down to grab a roast beef roll and sit right behind the goals (opposite the Cramer’s Hotel end), the surrounding banks of the ground were filled to the brim with passionate footy supporters with a beer in hand and sunshine on their face. 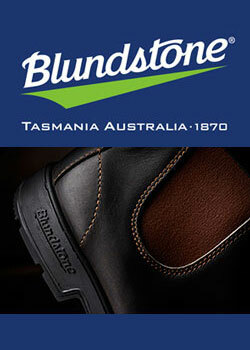 Enter Mike Brady. 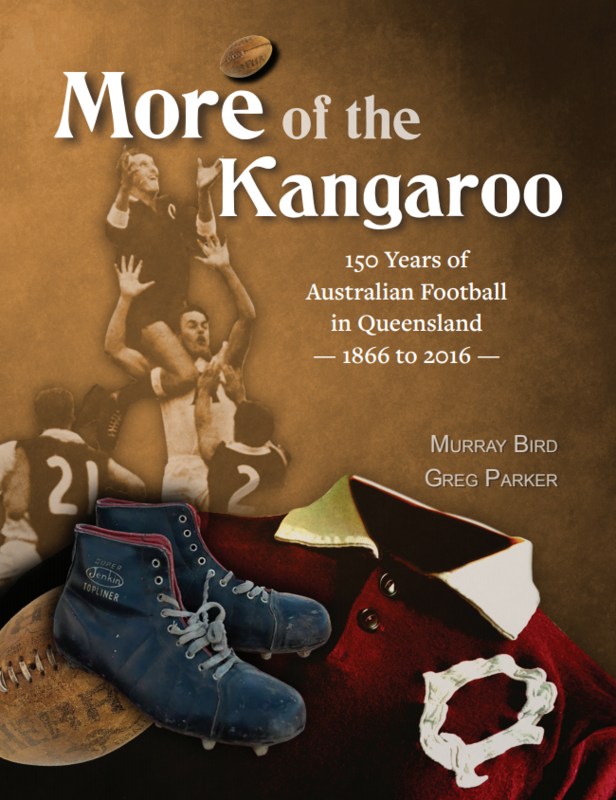 The NFL had chosen their entertainer perfectly, with the demographic of attendees singing along with ‘One Day in September’ and ‘Up There Cazaly”. The national anthem was performed flawlessly and enforced a hair-raising affect that is usually only experienced at AFL games. There’s something about local footy. When the clock ticked over to 2:15PM, the terrific build up cascaded into flamboyant yet bruising football. Both teams went hammer-and-tong at each other. However, the wind that heavily influenced the reserves Grand Final rose to prominence once more. With Macleod looking to obtain the tough task of going back-to-back (in the last few years the team going back-to-back had lost the Grand Final despite being favourites) they sent a goal flying right over my head within a minute and a half, as Hobbs started off perfectly for Macleod. Just 15 minutes in and trouble loomed menacingly over Heidelberg, who faced a six day turn around after a bruising Preliminary Final against Greensborough. With a quick double to Patrick Martin, the Tigers were already three goals behind against the wind. Enter Charles Gaylard. The playing coach jumped back into the fray after being knocked out cold in the first minutes of the Preliminary Final, booting the Tigers first major after a fifty metre penalty. At the time this goal, along with Daniel Connor’s clever left foot snap at the end of the quarter, were seen as desperately needed. However, the tide of the game would eventually go on to see these majors as a turning point in the match. These goals came with a price though; Gribben was red-carded early into the game after a seemingly innocuous incident. Behind by 21 points at the first change due to further goals from Paynter and Hobbs, the Tigers looked tired and slow. However, a stunning Marigliani running goal just 30 seconds into the quarter led a strong second quarter performance. With the wind, Heidelberg maintained possession and locked it inside their forward fifty for the best part of twenty minutes. Just as doubt started to creep into the ‘Berg camp, 17-year-old Lachlan Wilson capped off his strong start to the match by snapping an opportunistic goal through. The margin was now only five points. That goal was the tip of the iceberg, with goals flying through. Just a minute after Wilson’s drought breaker, Connors banged through his second to put the Tigers in front. Unfortunately, the AFL goal nous of Connors was to be missed, as he hobbled off the ground injured and didn’t return. Majors to Miller and Pianto capped off a remarkable five minute flourish. Heidelberg had changed their fortunes around completely. With Macleod not managing a goal into the wind, the Tigers held a 13 point lead at the main break. The momentum had changed completely by the time the third stanza began. 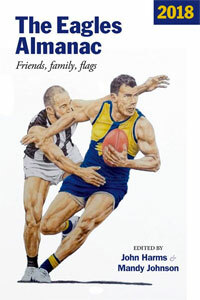 Known as the Premiership quarter, Macleod found a goal within thirty seconds. Martin’s third major for the game was followed by Paynter’s eleven minutes afterwards. 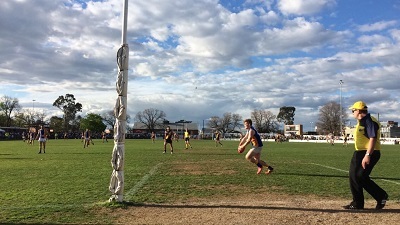 In a defensive manner, Heidelberg was making it their Premiership quarter, while Macleod were costing their chances with shoddy kicking. The Tigers just needed a goal to assert complete dominance over a Macleod side that were relying on too few. The goal came just five minutes later, with Marigliani capping off his full-ground dominance with a telling six-pointer. Macleod could only manage one more goal through Lynch before the siren made the spectators in the stands deaf. They had managed to regain the lead, but a two point lead appeared to be too slender against an aggressive Heidelberg outfit. Just five points down, Marigliani stamped himself on the game once more, snapping a miraculous left foot goal just a minute and a half in. The lead was theirs. Would they relinquish it from here? But, the never-say-die attitude of Macleod shone through at the right time, with Liam Brandt kicking their first goal against the wind to spark hope. He was by far the best for Macleod, leading a team that had too many passengers. This was contrasted by a Heidelberg side that included plenty of ex-VFL and AFL talent (Paul Bower, Daniel Connors and James Magner* all boasted AFL experience). They managed to dispel the concern about relying on their bought players, with the irony of Macleod’s junior predominant team relying on too few resulting in a tight last quarter. Macleod’s lead was short lived, due to one man. Enter Michael Finn. The man nicknamed the ‘Irishman’ stood up when it counted. After playing reserves for last year and plenty of this year, his inclusion in the Preliminary Final team resulted in the opportunity to clinch a flag. With an unsteady ball drop and kicking action, he finished off two strong marks, much to the delight of the drunken hill. Hodgkin’s goal in between allowed a buffer to be created, with many of the ‘Berg’s star players missing shots to secure a Premiership in the closing minutes. The misses were meaningless just minutes later. When the siren blasted out one more time over the packed Preston oval, players of both sides sunk to their knees. Some with clenched fists in the air amid passionate yelling. Others with a bowed head and already brewing tears of desolation. Heidelberg had managed to win, after walking out players*, a tough 6 day break and two on the bench for over a half of the game. It’s an understatement to say that the win was deserved. Supporters ran onto the field left, right and centre. Hugs were given to strangers, or to beloved players. Jordie Treloar; a contestant in the live final of the popular show The Recruit the coming Wednesday, was mobbed more than most. A rowdy rendition of the song could most likely be heard at the neighbouring market. But, a much louder roar filled the crowd five minutes later, as 17-year-old Lachlan Wilson was awarded the best on ground medal. It was a three way choice between him, Finn and Marigliani. 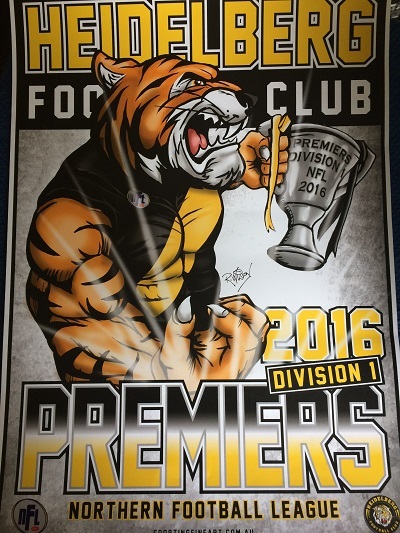 It wouldn’t bother Heidelberg, they had proven to the NFL community that they could win a Premiership after a few tumoultuous years. 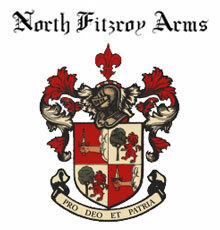 They were on top of the Northern suburbs once more. I left the ground, a grin on my face. I have no special allegiance to any senior team, but Heidelberg’s win was a preferred result for me. Either way, it’s just the effect of local footy. Nothing else mattered outside of Preston City Oval for the day. Local footy was the pinnacle. *: James Magner walked out on the club after being dropped to the reserves after their loss to Macleod in the first final. Goals: Macleod: Martin 3, Hobbs 2, Paynter 2, L. Brandt, Lynch. Heidelberg: Marigliani 3, Finn 2, Connors 2, Miller, Pianto, Wilson, Hodgkin, Gaylard. Best: Macleod: L. Brandt, P. Martin, H.Seivers, H. Paynter. Heidelberg: M. Marigliani, L. Wilson, M. Finn, P. Bower, M. Brunelli.